compare it to Walmart’s $168. 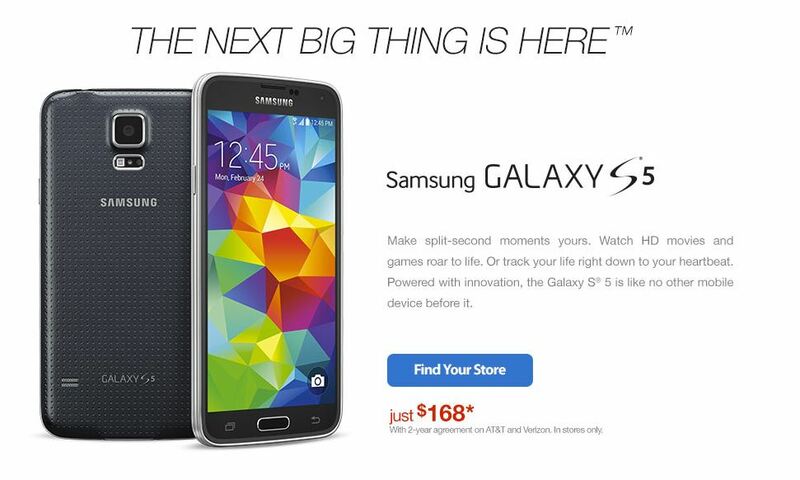 Walmart is offering Samsung Galaxy S5 deal for Verizon and AT&T carriers, in case you need to go for AT&T. time to grab the flagship and save $100! Snapdragon 801, 16 MP rear shooter with Phase Detection Autofocus, fingerprint sensor, heart rate monitor, dust & water resistance, and the usual storage options with microSD support. Warning: You might want to wait on that purchase if you are looking for a premium flagship as Samsung Galaxy S5 Prime is expected to arrive in June. No guarantees, though!